Federal budget season came and went this year without any budget proposal hitting the floor of the U.S. House of Representatives. This was an odd (and ironic) bit of incompetence by the GOP leadership, who couldn’t even wrangle a majority to support their own budget proposal. But it was especially damaging to U.S. economic policy debates because it limited attention paid to the budget of the Congressional Progressive Caucus (CPC). It’s true that political gridlock has meant the only live macroeconomic policy debate in DC in recent years has been around monetary policy. And the Fed’s decisions are important! But the abandonment of fiscal policy as a tool that could boost the economy, which began not soon after the recovery from the Great Recession began, is a real tragedy. 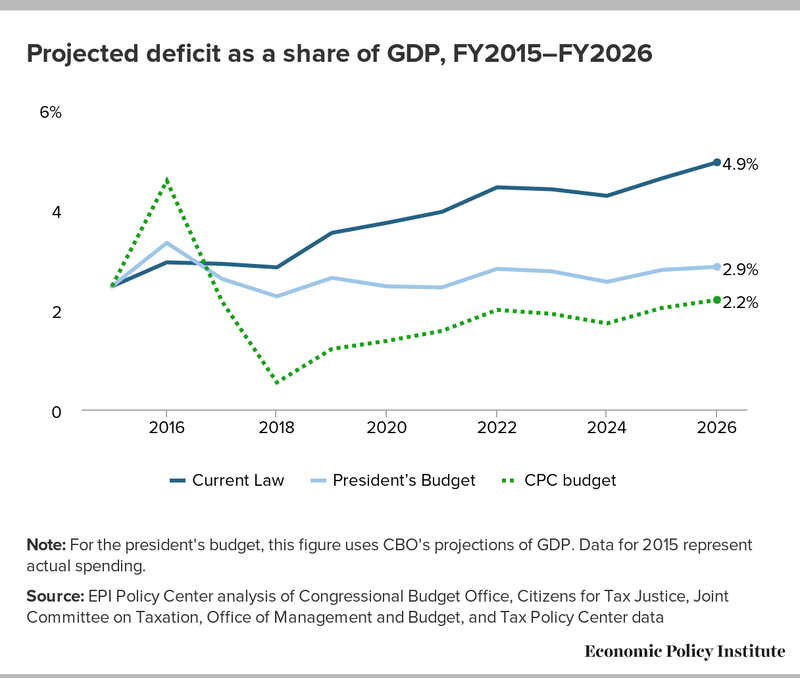 The CPC budget includes substantial upfront fiscal stimulus (mostly front-loaded infrastructure investments projects) precisely to accelerate the economy’s growth rate in the near-term. 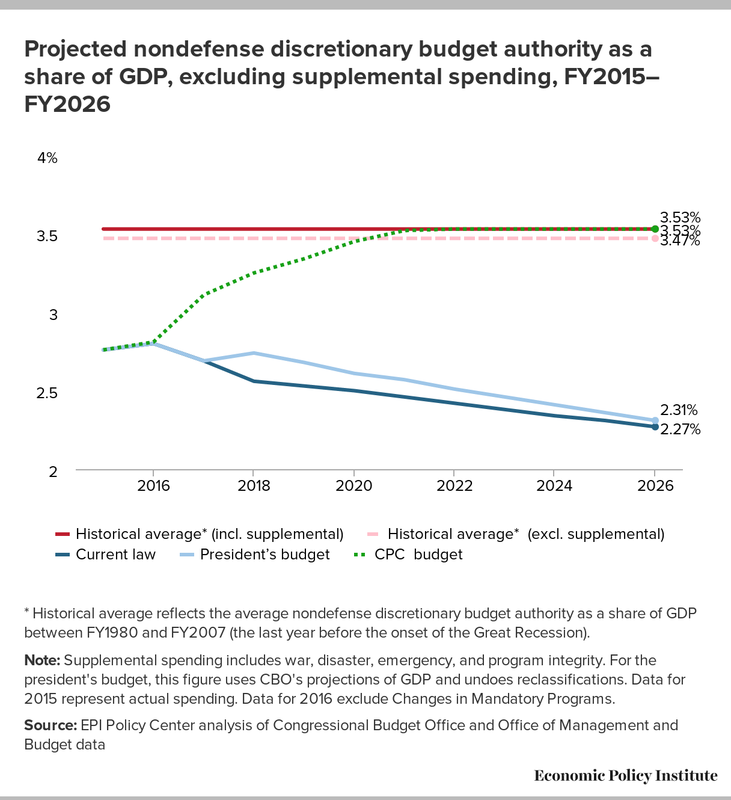 The CPC budget has a very substantial increase in public investment, specifically with boosts to non-defense discretionary spending, the budget area where the vast majority of public investment in the federal budget happens but which has been savaged in recent years by Republican Congresses. The CPC expands Social Security. Granted, it does so modestly, by changing the current annual cost-of-living adjustment to one that focuses on the expenditures of older households, which are disproportionately affected by health cost inflation. Of course, there are plenty of reasons besides the macroeconomic outlook to expand Social Security, not least of which is the complete failure of what was supposed to be a key leg in the retirement security stool—the 401k revolution. But Summers is right that this macroeconomic outlook makes the already compelling case for expansion even better, especially since Social Security is largely a pay-as-you-go system, whereas the other legs of the retirement security stool (pensions and private savings) are advance-funding mechanisms and can therefore reduce aggregate demand. Finally, we should note another crucial public investment that Summers’s analysis clearly indicates would be a huge win for the U.S. economy: an ambitious investment in American children, by providing universal access to high-quality early childcare and education. The Summers speech has been widely commented-upon, and rightly so—it contains a lot of wisdom. People should know, however, that the ideas in his remarks are embodied in real-world legislation proposed earlier this year, and which sadly disappeared without much attention, all because the Republican-led House could not even organize themselves to have the annual debate on budget proposals.